The run will go ahead rain or shine! Packet pick up (packet contains run t-shirt, bib and timing chip) will be available at Fleet Feet Sports, Menlo Park, Friday, May 29, from Noon to 4:00 p.m. and Saturday, May 30 from 10:00 a.m. to 3:00 p.m.
On race day, packet pick up will be available between 7:30 a.m. and 8:30 a.m. at Oak Knoll School. Family Sponsors have the additional option of collecting their packet on Saturday, May 30 at the family pasta night. Note: Race T-shirts are not guaranteed on race day. Wear your race t-shirt and bib provided in your Registration Packet. We also recommend you bring sunscreen, a hat, layered clothing, a water bottle, a small snack, and money if you would like to buy food from our Waffle Amore food truck. Parking will be extremely limited near Oak Knoll School. We encourage you to bike, walk or take the shuttle bus from Hillview Middle School parking lot from 7:45 a.m to 8:45 a.m. 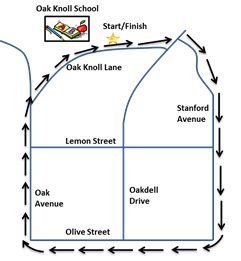 The shuttle will resume from Oak Knoll back to Hillview after the race from 10:00 a.m. to 11:00 a.m. Starting and ending at Oak Knoll School, the course is along flat residential roads. The 2.5K (1.5 miles) Family Run is one loop of the course and the 5K Competitive Run is two loops. No bikes, skates or dogs permitted. Strollers are welcome. There will be two separate finishing chutes (or paths). Left Finishing Chute: 5K Competitive chip-timed race (two laps of the course). Note: Far Right lane is for 5K runners beginning their second lap of the course. The lanes will begin as you pass the corner of Oak Avenue and Oak Knoll Lane as you make your way back towards Oak Knoll School. 5K runners MUST cross the START mat TWICE in order to be qualified for times and awards. Once you finish, you MUST exit the street. You can wait for friends and family while cheering them on from the sidewalk. No one is permitted to stand or walk between the finish and start areas. A small, white-foam, timing-chip is attached to your race bib. Do not remove it, fold it, or squash it. Wear your bib on the front of your shirt at waist height and be sure it is visible as you cross the start and finish-line timing mats. Note: Your time will not automatically start at 9:00 a.m. Your time will start when you cross the start timing mat. Your time will stop when you cross the timing mat at the finish line. Results will be posted to this website by the end of the day. Kids who complete the 2.5K family run/ walk (one loop of the course) will receive a finisher's ribbon! There will be plenty of family fun at our Wellness Fair, following the run. Put on your best smiles in the photo booth provided by Nelson Roberts, play flag-football with Bulldog Sports and attempt Kennolyn’s obstacle course bouncy house. When it is time to eat, head over to the Waffle Amore food truck, and don’t forget to visit the fair’s booths where over 30 sponsors will be offering giveaways.